Lucky 88 slot machine using the chinese culture theme with 25 lines and 5 reels from Aristocrat. 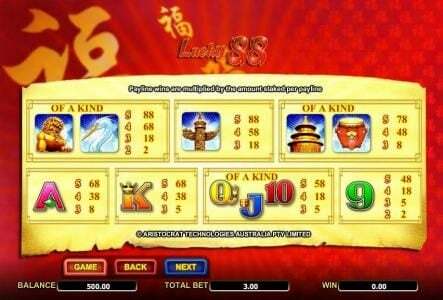 Lucky 88 Slots has not been reviewed yet, be the first to rate this slot. 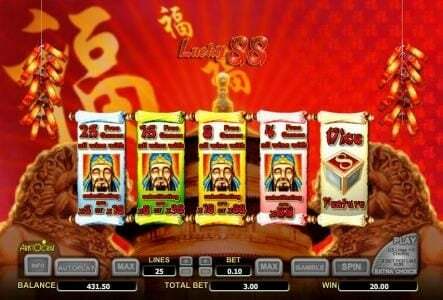 Lucky 88 gives us a game with 5 reels and with 25 paylines on them, an Aristocrat slot which offers a prize of $3,552 and as features wild symbols, scatters, free spins and some impressive multipliers. 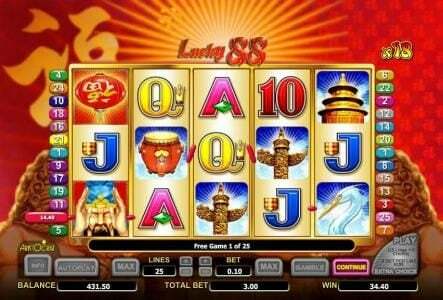 The number 8 is considered lucky in the Chinese culture, and it seems that this slot was built to bank on that. The game’s background is a red image, with rays coming out from behind the logo, and with firecrackers hanging from the top of the screen. The simple reels have a mix of symbols, including the standard playing cards that Aristocrat uses in most games, and the ones that are a bit different, related to the theme for the most part. Among these extra images you will find in this game gold coins, statues of dragons, paper lanterns, Chinese men, birds, musical instruments and a few others. 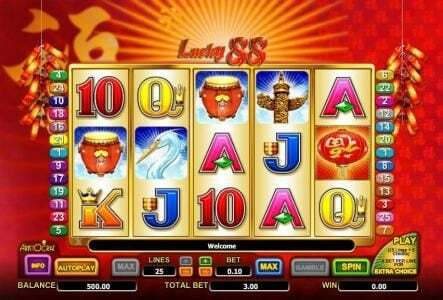 It’s a slot that looks decent enough, and I’m sure that you will have fun with it, as long as the features that are offered are OK. While it will not win prizes for its looks, the colors used and the symbols look good enough. The game’s wagers have two parts. 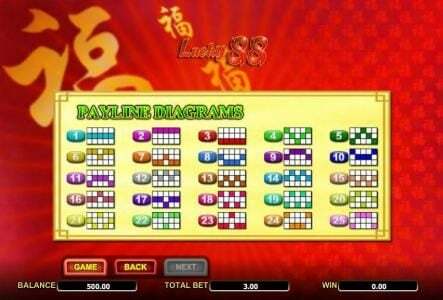 One of them is the simple bet on the 25 lines, with coins of up to $4, allowing for $100 to be wagered. 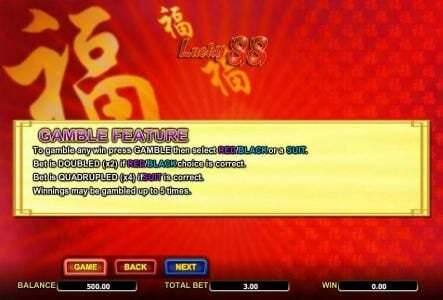 An additional 5 coins, or $20, can be wagered in the game, allowing for some extra chances of making money to be included. 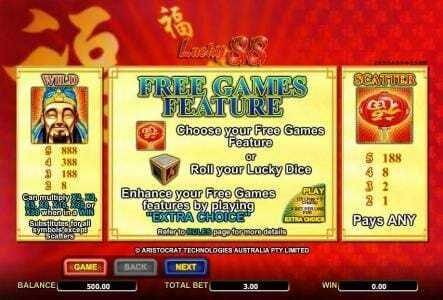 The game’s top prize is 888 coins, and its cash value is up to $3,552. 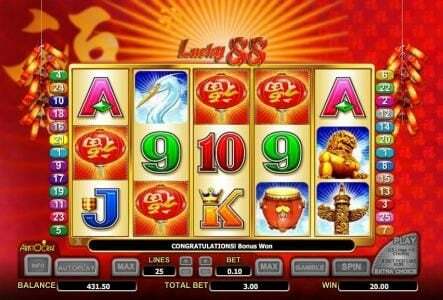 One of the things that makes this slot truly special is the multiplier that comes with the wild. The wild symbol does its usual job, trying its best to help the player form a new combination. The great part is the randomly selected multiplier which is used when that happens, and which varies between 2x and 88x. 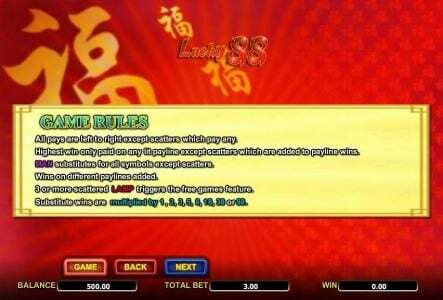 That’s right, up to 88 times the normal payout can be won, if you get a wild to help you form a new combination. 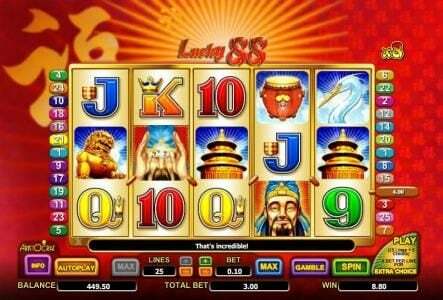 The same wild gives the player prizes, of up to 888 coins (top jackpot), when you get up to five of them on the same active payline. The paper lantern serves as a scatter symbol here, giving the player between 1x and 188x the bet made. 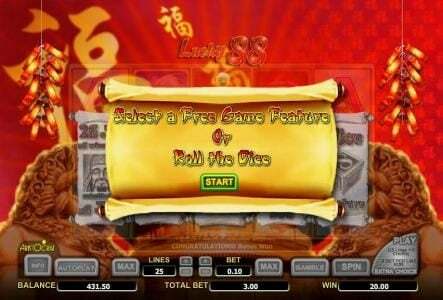 The player gets free spins as well, which he has the choice to use, or to use the Roll Lucky Dice instead. 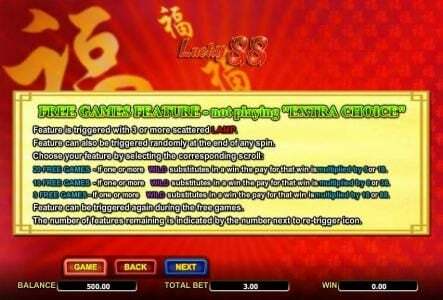 If the player wagered the extra 5 coins, he gets additional features as part of their Free Spins. 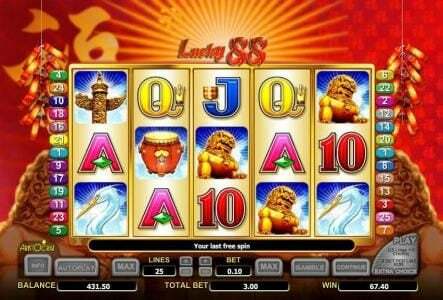 It’s a decent slot when it comes to the design, and a great slot when it comes to the multipliers offered. An 88x multiplier is something you will not find too often in a Slot.